This year the archaeological study of the Johnson’s Island Civil War Prison site continues with the exploration of Block 8. There are two areas of Block 8 under investigation. This is the third year for excavation of the actual location of the block, and the second year unearthing the northern half of a latrine form 1862-1863. In 2010 we explored the outside extension of the block that was used as a mess (food preparation). Last year we were able to explore the southern end of the block. This year we continue with the exposure of Block 8. The design of Block 8 was significantly differently than Block 4. Block 8 had three large rooms per floor to house captured enlisted soldiers. Block 4 had 11 small rooms per floor to accommodate captured officers. It is our hypothesis the design of the different blocks will manifest through different numbers of cultural materials deposited in the soils below the block. This is only our second year excavating within the actual block area, and we will need at least two more after this year to complete enough of the excavation for comparison to Block 4. Excavation of Block 4 required five years. As can be seen from this discussion, this type of research requires a very long-term commitment. However, after this year we will begin to look at the differences present between these two blocks. We are also excavating Feature 124, a latrine associated with Block 8. Excavation of this latrine started in 2010. 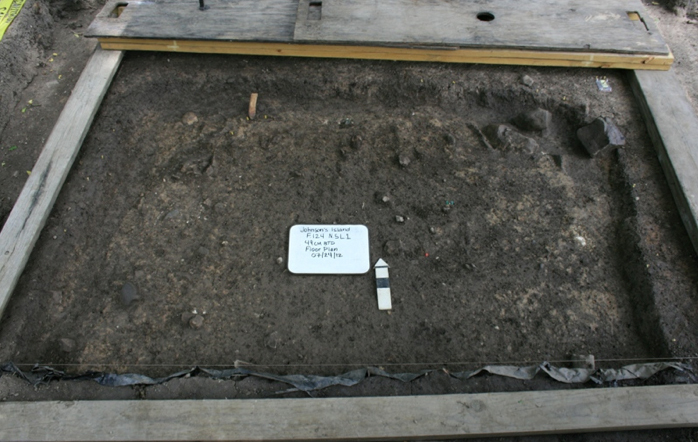 Excavation of the southern half of the latrine took place in 2010. Last year we were only able to explore the top 10 centimeters of the northern half. We are looking forward to completing the excavation of the northern half this year. The photograph shows the exposure of Level 1 of this latrine this year. A vertebrae is exposed in this level. As we proceed with this excavation, more will be presented of our findings. 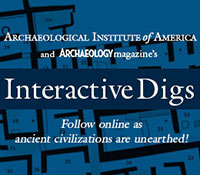 The next interactive dig entry will introduce the members of the Heidelberg University Archaeological Field School. This entry was posted on Monday, July 30, 2012 at 8:20 am	and is filed under Field Reports. You can follow any responses to this entry through the RSS 2.0 feed. Both comments and pings are currently closed. Is it possible to figure out how the prison got to be underground? Or was it just something that happened overtime. In the past 2 seasons there have been no more than the two field reports that I have found or am I missing them. I have always enjoyed following what the students have found, what they are excited about, and what they think. When they do weekly or bi-weekly field reports it gives the reader those opportunities. I, myself, am a student of Archaeology, studying at Trinidad State Junior College in Colorado and at Wright State University. FYI-When I read about Civil War digs or research, your work at Johnson Island is sometimes mentioned, so in my mind the work your doing on J I is also important to others who are doing similar or like research. Congratulations. From an old retired school teacher, who wishes he could still dig.